Birmingham, Alabama is known for its abundant rainfall and sometimes the occasional tornado or hurricane. In fact, Birmingham is located in the heart of a Tornado Alley called the Dixie Alley. All of these different conditions can greatly effect the safety of your business. If the foundation of your business isn’t secure, who knows what could happen in the middle of a severe storm? That’s where Atlas Piers can help. Atlas Piers provides great service and has all the tools needed for all your commercial foundation repair Birmingham Alabama needs. Whether the rainwater puts pressure on the foundation and causes cracks in the basement, or your building’s foundation is just settling, Atlas Piers has a way of fixing all your foundation issues. If you happen to notice these signs of foundation failure in your Birmingham business, don’t worry, just pick up the phone and call us at Atlas Piers. If you catch any of these signs don’t hesitate to call us, the longer you wait, the worse these conditions can get. Your company is a huge investment, and we plan on helping you to keep its foundation in great shape. This will keep the value of your business up and you and your customers safe. Whenever you need foundation repair in Birmingham, AL, Atlas Piers has just the right solution. For our projects we use products with Earth Contact Products (ECP). They make the best products for commercial foundation repair on the market. When we underpin your foundation, we are adding strength and stability to be able to lift your foundation to the original elevation. We use helical piers, steel push piers, and anchors to extend to a more stable layer of soil. The helical piers and steel push piers are put into the soil below your foundation and the weight is now evenly transferred. You now have a more stable and stronger base for your your foundation. Atlas Piers has the experience to make your foundation as good as new. If you find that you have a wet basement or damp crawlspace, fixing your foundation will solve your interior drainage issues. Atlas Piers also offers wall encapsulation. This is a process that covers your basement walls with a vapor barrier. This will keep moisture out of the basement and improve air quality and reduce the chances of getting cracks in the walls and flooring. If you reduce the cracks in the flooring and walls, it reduces the chance that you need interior drainage in your Alabama business. A vapor barrier also acts as insulation and keeps the structure warmer in the winter and cooler in the summer. There are many benefits to wall encapsulation. Atlas Piers of Atlanta will help keep your business from having interior drainage issues. So no matter what solution your business needs, Atlas Piers can help you. Whether it be a cracking basement wall or a settling foundation, we have you covered. Call Atlas Piers of Atlanta, your commercial foundation repair in Birmingham Alabama team. 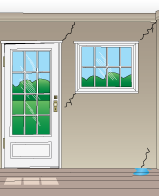 We will give you an estimate for your foundation repair costs.